The latest addition to iMovR's Cadence line, the Cadence Plus is a middle option between the Cadence Express and the Cadence Pro. It features a dropped keyboard like the Pro, and a sleek, lightweight MDF core like the Express. Free shipping in continental US. Additional charges for AK, HI, Canada. DHL available for international. Ships within 8-10 business days of order. 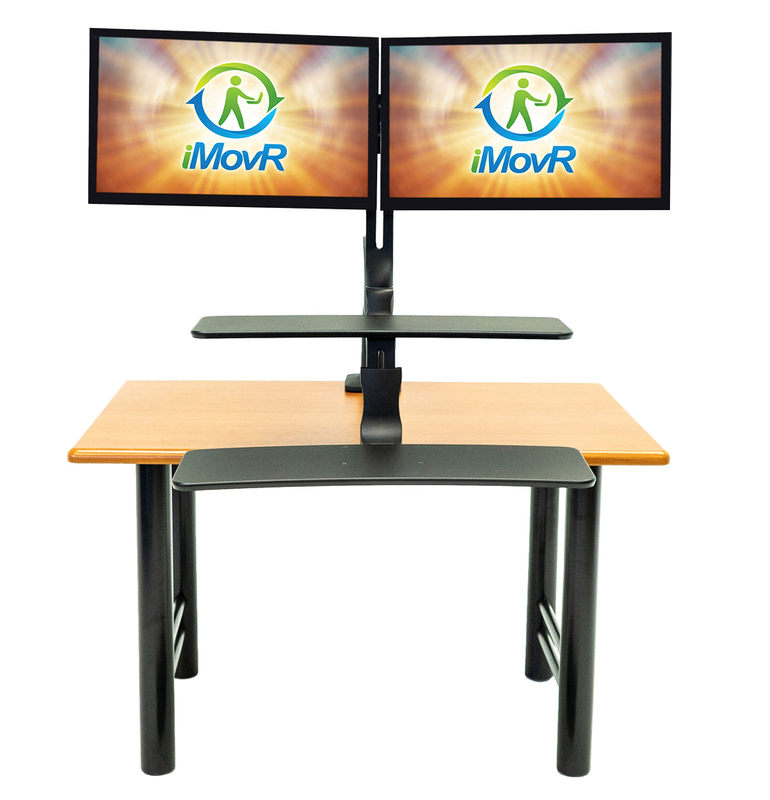 Like iMovR's other Cadence models, the Cadence Plus's "Hovering" Design preserves desk space and allows you to easily move your workstation around a large, 3D space. Its 22" height adjustment range is shorter than the Cadence Pro's, but plenty wide enough for users up to 6' 5". It features a height-adjustable, angle-adjustable keyboard tray for optimal comfort and ergonomics while you work. 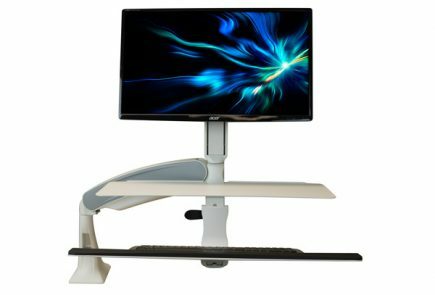 With a design that “hovers” over your desk, the Cadence Plus allows you to keep virtually all of your desktop real estate as accessible as ever, and allows you to swing your keyboard and monitors completely out of the way, or easily share with collaborators. Its lightweight MDF core worksurfaces make spatial adjustments easy and offer a sleek matte-black look. While 'hover' style desk converters are inherently less stable than Z-Lifts like the ZipLift or Flexispot workstations, the Cadence Plus's unique design more than makes up for its shortcomings, and is ideal for collaborative, and paper flow-intensive workspaces. 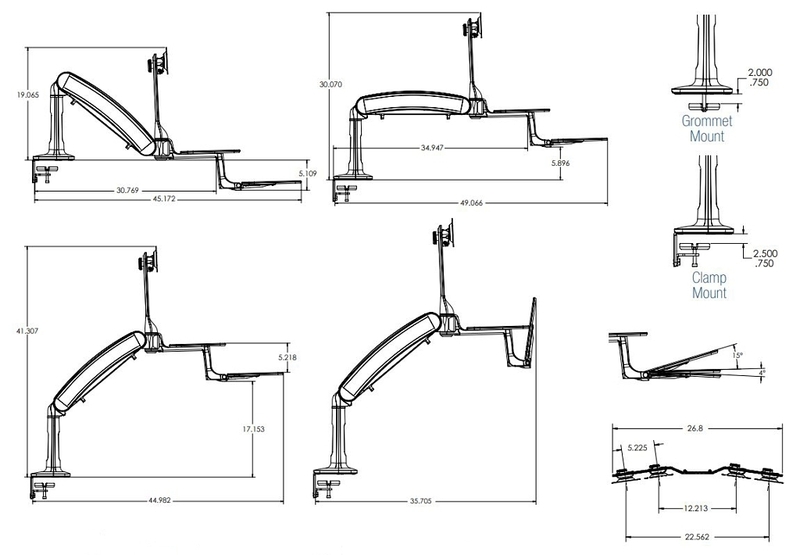 Work Surface Dimensions 9" x 28"
Keyboard Tray Height Adjustment Range 3.43"